Abstract : The aim of this project is to develop Interventional Radiology (IR) simulator models for core skills training. Background.There is a shortage of radiologists trained in performance of IR procedures. Visceral and vascular IR techniques almost universally commence with a needle puncture, usually to a specific target for biopsy, or to introduce wires and catheters for diagnosis or treatment. These skills are learnt in an apprenticeship in simple diagnostic procedures in patients, though there are drawbacks to this training method. In addition, certification depends partly on a record of the number of procedures performed, with no current method of objective IR skills assessment. Computer based simulation is just one of a range of alternatives to apprenticeship training, which include physical and animal models, and rapid prototyping models to train catheterisation skills. Fixed models are expensive, lack physiology, have fixed anatomy and are destroyed by repeated needle puncture. Animal models have anatomical differences, lack pathology and, in the UK, political acceptability. 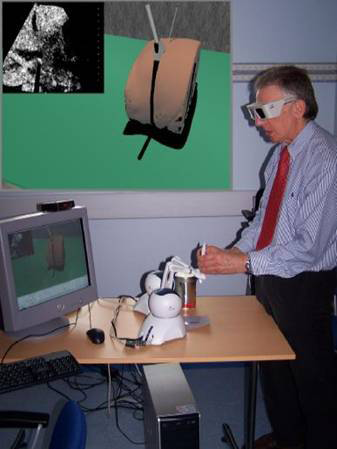 Realistic Virtual Environments (VEs) can be derived from imaging data, with potential to introduce physiological processes,tissue deformation and haptics(touch).Patient anatomical variability and pathology can be obtained from multimodality (MR, CT) imaging studies using a series of semi-automated processing steps to segment ('label' in 3D) the anatomical data. Accurate simulation requires incorporation of data from procedural Task Analysis into the development phase, including critical procedure steps and their metrics for objective measures of operator competence. Novel, semiautomatic segmentation of patient specific imaging data have been developed at Leeds and Imperial to generate anatomically realistic three dimensional VEs that reflect variability across patients. Validation:Few, if any, simulations have been convincingly validated for training IR skills, though this should be achievable where content (replication of procedure steps) and fidelity (faithfulness of that replication) are appropriate to real world tasks. Indeed correct reproduction of the task, and appropriate fidelity are the cornerstone of producing a simulation that has relevance to a particular training objective. In our projects, validation draws on the team's occupational psychology expertise (at University of Hull) with evaluation by clinical radiologists at Liverpool, Leeds and Manchester. The simulator has been designed for use exclusively within radiology training curricula.